Finding a good theme or Website Template is one of the most important aspects of building a blog. Some experts even consider it the most important thing while starting a new website. After all, your blog has to be attractive yet simple enough so the visitor does not feel confused. Only then he will think about returning back to your blog after the first visit. And there is an old saying in blogging(ok, not that old maybe) that "your blog is not made by people who visit your blog, but by the people who visit your blog again". But again your Theme should be both SEO friendly and Adsense ready too. Otherwise, you won't be able to money from it. A clear and simple design works with almost every niche when it comes to Ad positioning and high ctr. And Designblog gives you exactly that. Made with only 2 main colours - White and Blue, the theme has two columns and 7 possible spots where you can put your Ad codes and start earning. CickRight is Another simple but effective theme to increase your ctr. CickRight follows the Google heat map and gives you the option to place Ads on 2 of the highest performing ad slots, first in the header section and 2nd in the top of the sidebar. The developer has created 3 different versions of this theme to fulfil your needs. You can buy all 3 of the themes only at $69. Different from the normal magazine templates who fill the gap with anything they can find, ADMAG is a magazine template which focuses solely on content and helps you to display the best content from every category at the top without confusing the readers. But at the same time, ADMAG is so clearly coded that you can put ads on the places which give the highest ctr. It's also one of the fastest loading templates in the list which gives you an advantage in SEO. If you are looking for a magazine template for more colourful topics such as fashion then look no further than GOLIATH responsive WordPress theme. The wonderful Slider ad the top of the template allows you to display the best content from your blog and the Ad slots make sure you don't miss any opportunities of earning. The theme also includes a product review feature. MH Newsdesk is one of the most powerful WordPress themes for news sites that work on a single niche. It's modern and Dynamic features are designed to give all the attention to the content. The theme is highly customizable means you can use it on many different blogs. It has ad slots in all the main places to insure the highest earning potential. Schema is a fully responsive and SEO friendly WordPress theme which comes with many great features. It has a built-in product review feature. 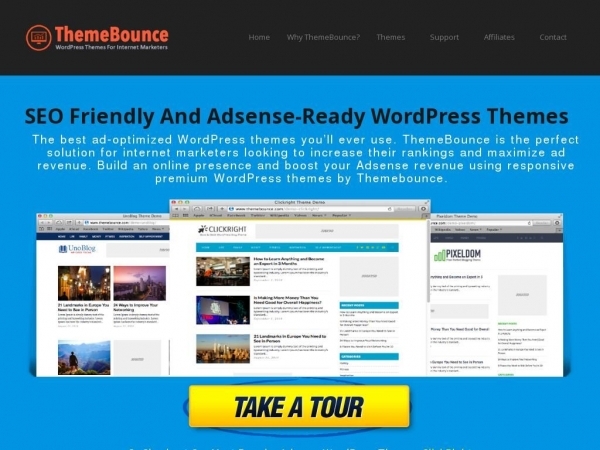 In my opinion, It's the best WordPress theme available for an affiliate niche site. The simple and fast loading design will make sure the focus is on content and the ad slots will make sure that when the user decides to buy a product it's from your referral link only. Adsense pro ultimate is the no doubt the best SEO friendly and Ads ready WordPress template for micro niche sites. Micro niche sites are sites based on subjects with low monthly searches and you definitely want to make the most money from every single micro niche site. In order to do so, your theme should be solely focused on providing the highest ctr rates possible. This theme provides the best ad placing opportunities to make sure you make the most out of your site. The best things in this world are the simplest. And Nominal is one of the simplest yet best WordPress themes provided by the developers. The theme is rich in colour and highly customizable. It allows you to build a powerful site for a single subject. The ads placement is in all the right places so even the laziest users will notice it and if your subject is powerful enough, then you are sure to have a great ctr. Newspaper is one of the most popular themes used on WordPress. If you'll make a list of most downloaded WordPress themes then Newspaper will easily make it to top 5. And it's very easy to see why. This SEO friendly theme allows you a very powerful and customizable back end with a beautiful and slick front end. You can start your blog with 2 or 3 subjects and increase the columns etc as your blog grows. The theme has all the required Morden features such as an awesome slider and Review options. And finally the best. Despite the fact that newspaper is a great magazine template with lots of features, the truth is that most of the blogs are based on the single subject and they need a good SEO optimised theme according to that. And today's online world is all about images and videos. So your theme needs to be colourful enough to match with the image ads that create the highest user engagement. This theme does it all and more. It has great customization panel and features that will you fall in love with this theme. 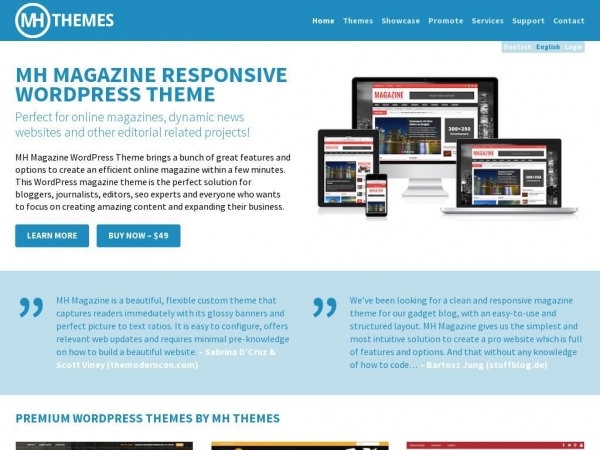 So these were our favourite WordPress themes. Which one of them do you find most useful? Do know any better theme which deserves to be on this list? Do let us know in the comment box. Thanks for this top 10 list. 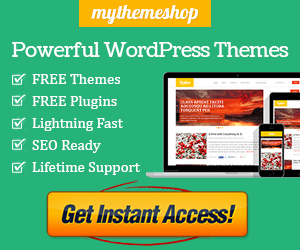 But i am looking for free adsesne freiendly themes for my wp blog. All super clear and clean. Signing off from kinda sunny NJ. Thanks Ryan For your wonderful feedback. Thanks Ravi, perhaps in the near future i will try to use a paid template for Adsense optimization, because right now i am still using the free wordpress themes. Nice lists but all are paid. Can you please share the best free adsense and seo friendly templates lists for wordpress blog.